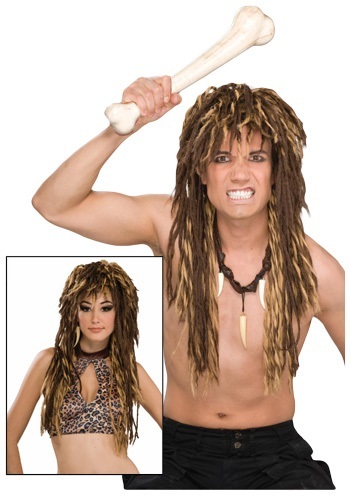 If you want to be a passable Neanderthal for Halloween then you’re going to need the right hairdo. One that others will think would have been lost in the sands of time. Well, whichever way they used to style their hair in the time of the dinosaurs is actually long gone and lost forever... but we like to think we’ve come pretty close. Take a look at this exquisite Caveman Wig! You can look like you’ve got a serious head of cave hair when you toss on this wild wig. This accessory is unisex, so whether you want to be the fiercest cave-warrior or the most dazzling women in the prehistoric era, it can help you get the right look. It is styled with dreadlocks and has shades of both a lighter and darker brown. Pair it with one of our many other Caveman inspired costumes and you’ll be the talk of the night. Everyone will think either the museum exhibits are coming to life again or a tear in time and space has occurred somewhere near!